You’ve decided you want to move to Barcelona. Now what? You need to find a place to stay. You are looking at the neighbourhoods, checking where the best bars are, where you university or workplace is located and then you start looking for flats. But money is also an issue right? Well, the student accommodation provider Uniplaces thought about it and decided to help you out. 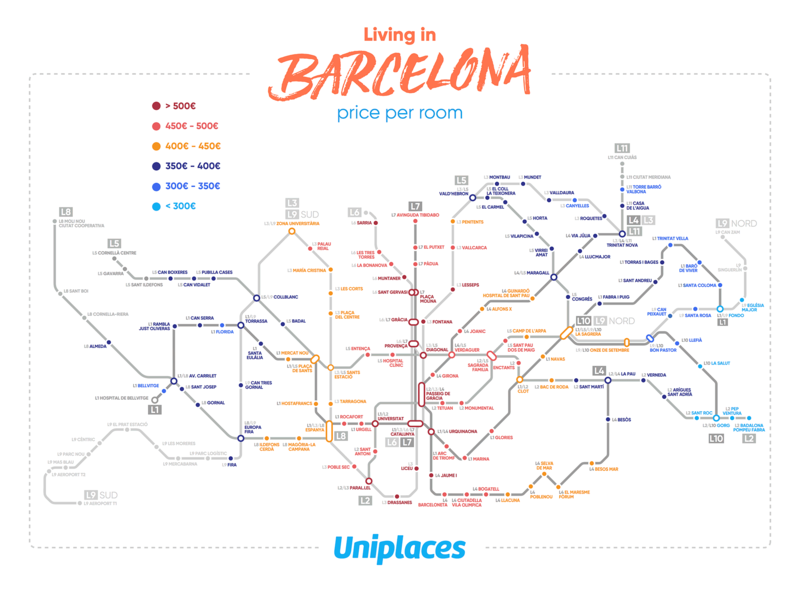 Based on their own research, they used the Barcelona metro map to create a “Rent Price Map”, with the average rent price per metro station. Here you can clearly see (and as you might expect) that the most central neighbourhoods are also the most expensive ones, like El Raval and Barri Gòtic, with average rent prices about 450 euros for a room. Gràcia, one of the trendiest neighbourhoods nowadays, follows the same trend. As you start moving further away from the centre, the rent prices will be lower. If you are a Barça fan and you want to live close to Camp Nou, Les Corts has prices of around 350 euros. The same is true of Sant Andreu. Sarrià-Sant Gervasi has medium-range prices, around 400 euros. Whatever neighbourhood you choose, you can be sure that you’ll have an amazing time in the Ciudad Condal! What do expats like least about Barcelona?